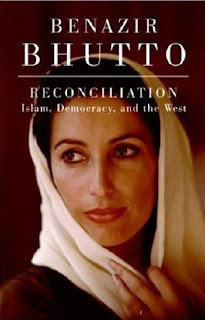 Former Pakistani Prime Minister Benazir Bhutto's posthumous book titled "Reconciliation: Islam, Democracy and the West" is being released February 12,2008, exactly 6 days before the crucial voting in Pakistan. Ghost-written by Mark Siegel, Washington lobbyist and Bhutto's personal friend, the book was originally planned for release in April, 2008. However, publisher HarperCollins, a division of Rupert Murdoch's News Corporation, decided to pull the release date in with the approval and cooperation of Bhutto's widower Asif Ali Zardari and Bhutto's children. According to published reports, the book arguing that Islam should be reconciled with democracy, is among the final works produced by Bhutto before her assassination at a political rally on Dec. 27, 2007. "No one could have known that these would be Benazir Bhutto's final words, and somehow that makes them carry even more weight, especially at a time like this," said Tim Duggan, her editor at HarperCollins. "This book is her legacy." HarperCollins had signed up the book for an estimated advance of 75,000 dollars just ahead of her return to Pakistan in October after eight years of self-imposed exile. The publishers are expecting brisk sales and New York Times best-seller status for this book. Among some of the shocking tidbits from the early publicity material from the book, there are revelations about Bhutto's belief that Osama Bin Laden's son Hamza or Taleban leader Baitullah Mehsud was planning her assassination. It should be noted that the Pakistani Government, the CIA Chief, and unnamed British officials believe Mehsud killed Benazir Bhutto. Bhutto's husband and her children have added a short afterword to the book. What If Pakistan Opinion Polls Are Wrong ? Does Pakistan Face Debt Crisis? Pakistani Media: Where Are The Fact-Checks? Are Pakistani Tribal Elders Losing Influence? Can Pakistan's Economy Defy the Odds? Cricket Super Bowl in South Asia? Riaz Haq commented on Riaz Haq's blog post Modi's India: A Paper Elephant?